Simply pick up the phone and let me know that you’re ready to get started. I have a fitness plan that’s just right for you and together we will get you into the best shape of your life. Well-meaning folks, like yourself, lose the battle of the bulge to a bunch of excess healthy calories. I’ve got to level with you: When it comes to gaining and maintaining fat, ANY extra calorie does damage. No matter if it’s whole grain or processed, sugar-free or sugar-filled. Pay attention to your total calorie intake. It really does matter. I’d love to help you figure out your ideal calorie range. Call or email me today and we will get started. 1. Preheat oven to 400ºF. Cut the spaghetti squash in half. Scoop out and discard the seeds. Spray the center of both halves of the squash with cooking spray, and place the cut side up on a cookie sheet. Roast until tender when pierced with a knife, about 50 minutes. 2. Remove the squash from the oven, and let cool. Once it’s safe to handle, scrape the flesh into a large bowl. Add the steamed broccoli florets to the bowl, and set aside. 3. In a large saucepan, melt the coconut oil on medium heat, and whisk in the coconut flour. Add the coconut milk, and whisk quickly. Turn heat down to low, add the cheddar and ½ cup grated Parmesan to the saucepan, and stir until melted. Remove from heat. 4. 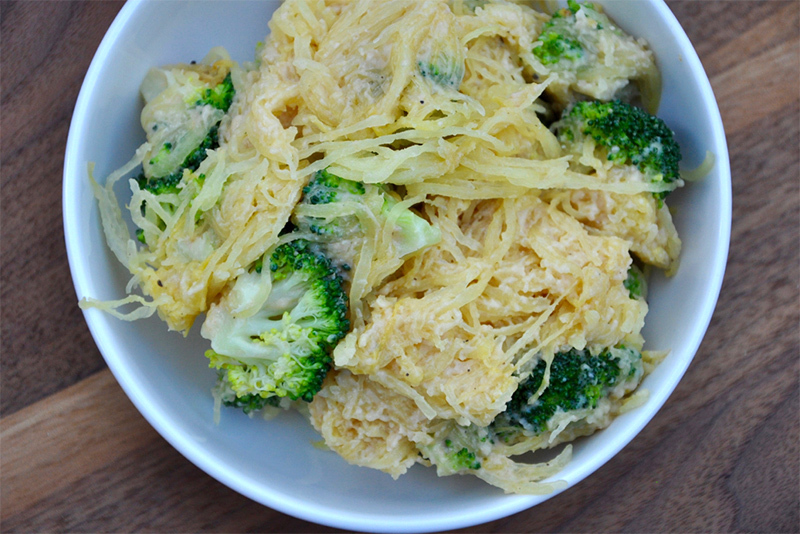 Pour the cheese sauce over the spaghetti squash and broccoli mixture, and toss until all the squash is covered. 5. Dish into 4 portion, and top off with the salt and pepper to taste plus red pepper flakes and extra Parmesan if you wish!